Clyde was rescued from a high-kill shelter. He’s a purebred cocker spaniel. He was groomed for free by Lori Cox, who made him look very handsome and sweet smelling too. Thank you, Lori, for donating your time and wonderful services. Clyde is about 3-4 years old. He is very gentle and calm. He loves people and is currently living peacefully with several cats in his foster home. He is crate trained and his foster mom says he hardly ever barks. He enjoys the outdoors, so a home with a secure, fenced-in yard would be ideal for him. Thanks to Corina for fostering (and spoiling) him! 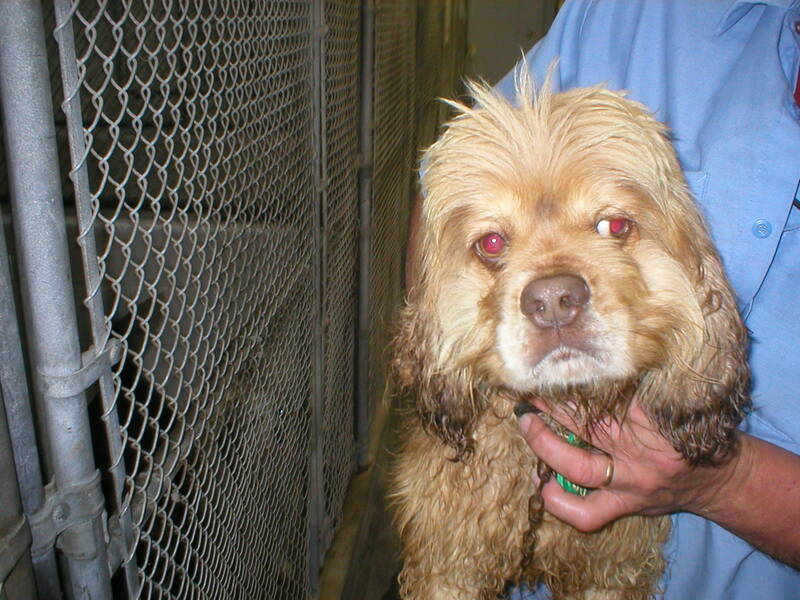 We do not have a picture of him after he was groomed, but this picture was taken in the pound the day we rescued him. He is much happier now!